An arpeggiator made with SVG! Before attending the An Event Apart 2017 conference in Chicago last month, I didn't know much at all about SVGs, or even what an arpeggiator was. One of the speakers, Chris Coyier, gave a fascinating talk about the possibilities of the vector image format. And some of the examples he used included things like logo animation, shape morphing, spinners, art. He even had a music example - an arpeggiator created on CodePen by Jake Albaugh. If you're interested, there's a great article about arpeggiators here. In short, an arpeggiator is commonly found on a synthesizer, and 'provides synth players with an easy way of playing complex synth parts via simple chords'. 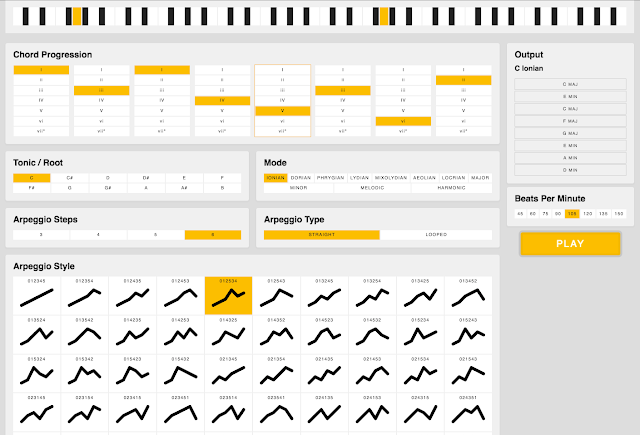 Besides being built entirely with SVG, Albaugh's arpeggiator (which you can interact with) has a good user experience too. The keys at the top of the screen and sounds simulate the chord progression in a clear, helpful, and fun way. All of this done by using SVG - it's a very interesting and useful application to music.